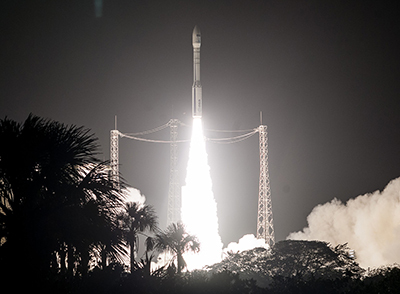 The launch took place on Monday, March 6, at 10:49 p.m. local time from the Guiana Space Center (CSG), Europe’s Spaceport in Kourou, French Guiana. This was the third launch of the year for Arianespace and the first in 2017 with the Vega light launcher. 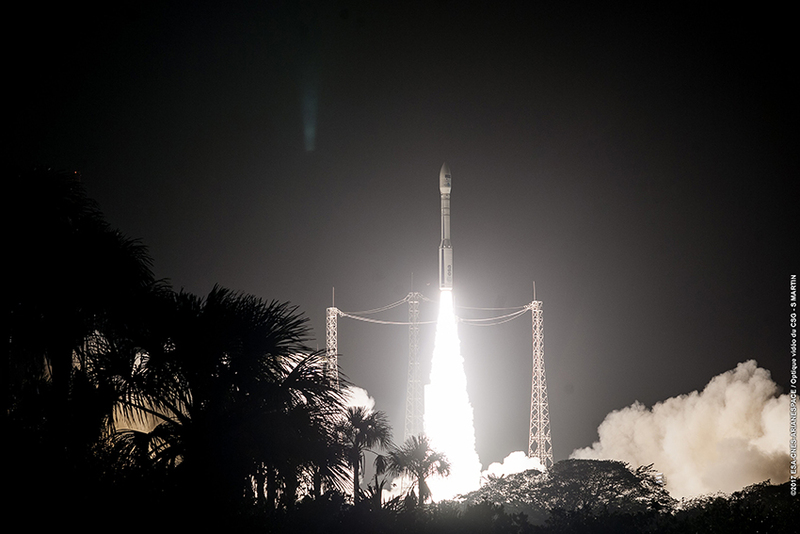 It also marked the ninth successful launch in a row for Vega, which made its debut at the Guiana Space Center in 2012. With this latest successful launch, Arianespace once again demonstrates its commitment to sustainable development, while also carrying out its mission of guaranteeing European independent access to space. Following the successful launches of Sentinel-1A, Sentinel-2A and Sentinel-1B, today’s mission with Sentinel-2B marks the fourth satellite in the European Commission’s Copernicus Earth observation program to be orbited by Arianespace from the Guiana Space Center. The Sentinel-2B Earth observation satellite mainly focuses on monitoring land masses and coastal zones around the world. It will be positioned in an orbit opposite that of Sentinel-2A to ensure optimum coverage and data delivery. The pair of Sentinel-2 satellites will cover the Earth’s entire surface in five days. This high frequency means they will capture brand-new views of the Earth, driving considerable progress in monitoring and predicting changes in vegetation and aquatic pollution. Sentinel-2B combines a multispectral, wide-swath, very-high-resolution optical imaging instrument with a dedicated platform developed by Airbus, a long-standing partner to Arianespace. It is the 117th Airbus-built satellite to be launched by Arianespace. There are 16 more satellites from this manufacturer in Arianespace’s order book, not counting the OneWeb constellation. Sentinel-2B is the 61st Earth observation satellite to be launched by Arianespace. These types of satellites represents 10% of all spacecraft launched by Arianespace since being founded, and 23% of its current order backlog (in number of satellites). Sentinel-1 will ensure data continuity with the ERS and Envisat radar satellites. Sentinel-2 and Sentinel-3 are designed to help provide a better understanding of how climate change impacts our daily lives. Sentinel-4 and Sentinel-5 are dedicated to meteorology and climatology, with a special focus on studying the composition of the Earth’s atmosphere. Sentinel-6 will measure ocean topography, mainly for operational oceanography and climatology. With this launch on behalf of the European Commission and within the scope of an ESA contract, Arianespace fulfills its mission of guaranteeing independent and dependable access to space for Europe. In 2017, Arianespace also will orbit four additional satellites for the Galileo program on behalf of the European Commission and ESA. and the James Webb Space Telescope (JWST). The eight previous missions performed by Vega prior to Flight VV09 included both government and commercial customers. Looking ahead, the launcher’s order book – primarily comprising Earth observation missions – now counts seven launches, one-third of which are for European institutions and the remaining two-thirds for export customers. Be more competitive as a result. Vega is a European Space Agency (ESA) program, financed by Italy, France, Spain, Belgium, the Netherlands, Switzerland and Sweden. The launcher design authority and prime contractor is ELV/AVIO, an Italian joint venture between Avio (70%) and the Italian space agency ASI (30%). Arianespace markets and operates this light launcher, alongside the Ariane 5 heavy launcher and the Soyuz medium launcher. Shortly after the announcement that the Sentinel-2B satellite had been injected into orbit, Arianespace Chairman and CEO Stéphane Israël said: “With this third launch of the year, and the first in 2017 for our light launcher, Arianespace guarantees Europe’s independent access to space and continues to support actions in favor of sustainable development. Sentinel-2B is the fourth satellite launched by Arianespace for the European Copernicus program. The Sentinel-2B satellite was built by Airbus as prime contractor, leading an industry consortium. Sentinel-2B weighed 1,130 kg at launch, and will be positioned in Sun-synchronous orbit at an altitude of 786 km, with an inclination of 98.57°. The launcher carried a total payload of 1,208 kg on this mission.